Marnie (Susan Sarandon) doesn’t know what to do with herself after her husband dies so she moves closer to her daughter Lori (Rose Byrne) and soon befriends Lori’s friends and tries to fully intergrate herself into Lori’s life. 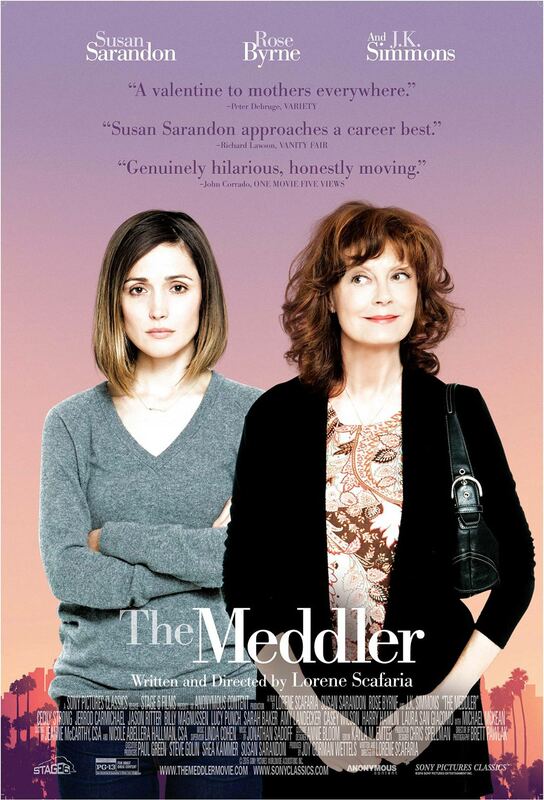 The Meddler is about grief. It’s been over a year since her husband died but Marnie misses him terribly and suddenly has way more money than she knows what to do with thanks to his life insurance payout. She becomes overly generous because of that, paying for her daughter’s friend Jillian’s (Cecily Strong) wedding and buying expensive gifts for just about anyone she meets. She even befriends Apple store worker Freddy (Jerrod Carmichael), convincing him to take night classes and then even driving him to and from them. The problem with Marnie is I did not like her. I understand why she is being so interfering and clingy as it’s because she’s still grieving and is focussing on everyone around her instead of thinking about her dead husband but that still didn’t stop me from wanting to throttle her. While Lori obviously still loves her mother, even though she annoys her a lot of the time, as a viewer I had no fond feelings for her at all. The Meddler is heartfelt and sometimes funny too. The performances are all great and Sarandon is a standout but that wasn’t enough to get me to look past how much I disliked Marnie. Unfortunately my dislike of Marnie had a knock on affect and made me dislike the film itself. 2/5.